Social Media, today, is playing a very important role in the politics of almost every nation. 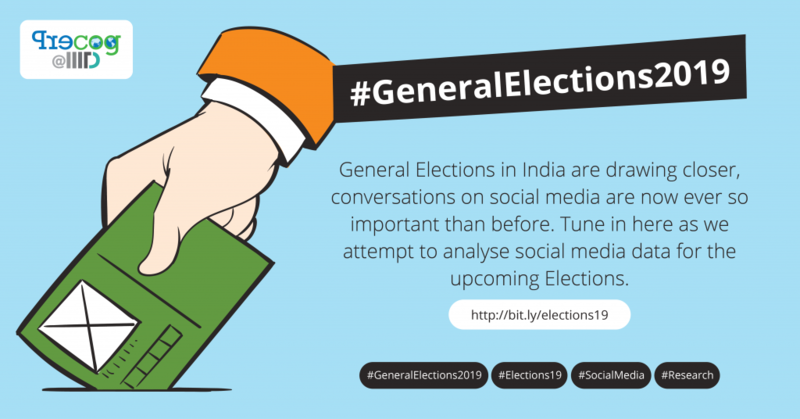 In India, there has been a boom in social media political campaigns, which was more marked in the 2014 General Elections. All major political parties used social media to promote their manifestos and interact in the public domain in a one-to-one manner. They analysed different views of the people, and worked on them. The Home Minister, in a seminar after the 2014 general elections, also said that “Through social media, the government is outlining its plan, its vision”. After assuming power, the NDA government has been using Twitter, Facebook and blogs to outline its plans, vision, showcase the progress, and other updates. One of the major reason for this was to involve and cater to the interest of the youth of the country, that are active on most social media websites. Owing to this, political parties have invested huge amounts of funds into social media campaigning, hence also increasing their reach. Formerly our work for the 2014 General Elections involved heavy analysis of Twitter data. 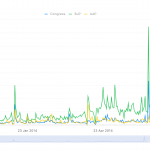 The work was supplemented by developing a portal that captured the intricacies of the political campaign leading up to the election as a mirror of the social media. In order to kick off the next sprint of analysis for the upcoming general elections of 2019, we decided to revisit the data gathered in 2014. 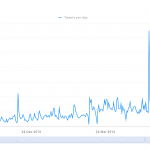 We had over 21 million posts by roughly a million handles collected in the last sprint of analysis that ran in 2014. 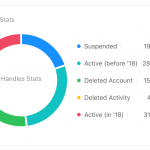 An inspection of the handles lead us to find that currently only 31.64% of the handles are still active (defining activity as the handle having posted at least one tweet in the year 2018). Thereafter, the deleted and suspended handles constitute upto 15.65% and 19.81% of the total users respectively. We are building a portal to analyze the 2019 data and help see through the data that is getting generated on social media. Stay tuned as we unravel further analysis for the forthcoming election cycle. Below are some images from the portal landing page. We hope to do more analysis of the data that we are collecting from 2019 Elections. By PK Comments Off on Has the battle for General Elections 2019 shifted online?